Have you been looking for a light recipe to bring to a picnic, or a special event? I have a perfect one for you to proudly whip up, and to enjoy with your family and friends. 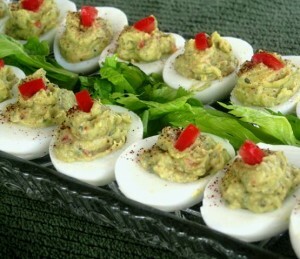 I like preparing deviled eggs, because they are such a fun party food to bring along, and very easy to prepare. Since some people are not very fond of mayonnaise, this recipe is perfect, as it uses a mashed avocado instead, as well as only some of the egg yolks, cutting down on overall cholesterol, and calories. This recipe yields 12 servings. Peel the hard-boiled eggs, and cut in half horizontally. Remove the yolks. Save 2 yolks, and discard the rest. Cut the avocado in half, and scoop it out. Place the 2 egg yolks, avocado, lime juice, and onion in a food processor, and pulse until creamy. Fold in cilantro, jalapeno and tomato. Fill a pasty tube with the egg mixture, and fill the egg white halves. Garnish with a spring of cilantro, or a snippet of red pepper, or tomato. If you do not have a food processor available, you can mash the avocado and egg yolks with a fork, or press it through a sieve, using the back of a spoon. I AM WONDERING IF THERE IS A WAY TO PRINT THESE RECIPES WITHOUT WASTING ANY PAPER? FOR A 1 PAGE RECIPE I END UP WITH 4 PAGES , THREE OF WHICH ARE WASTED. You can highlight the section you wish to print (ingredients and directions), and print only that selection (one page total). I hope this helps…thank you for stopping by.